Squamous cell carcinomas (SCC) are the majority of Head and Neck tumors and their incidence is increasing significantly in developed countries. In the USA, the incidence increased by 22% from 1.53/100.000 to 1.87/100.000 between 1999 and 2006, after showing no change between 1975 and 1999. The UK has seen a doubling of incidence between 1990 and 2006. There has been a further doubling in incidence between 2006 and 2010. Etiology of SCC remains multifactorial, but smoking and alcohol consumption play a crucial role. Recently, HPV virus (type 16) infection has been identified as a predisposing factor for SCC of the oral cavity. Diagnosis is made based on a histopathological examination of a biopsy sample. Ablative surgery in conjunction with radiotherapy for localized treatment and adjuvant chemotherapy for distant metastasis treatment is the modality of choice. The resultant oronasal communication makes mastication and deglutition difficult for the patient and impairs speech. A maxillary tooth-retained obturator is commonly used to restore the separation of the oral and nasal cavities. However, there are numerous disadvantages with the use of the obturator, which include inadequate sealing leading to poor oronasal separation and instability of the prosthesis due to the lack of buttressing areas. These become more evident when the resection defect is wider and posteriorly placed or when the remaining maxilla is fully edentulous. 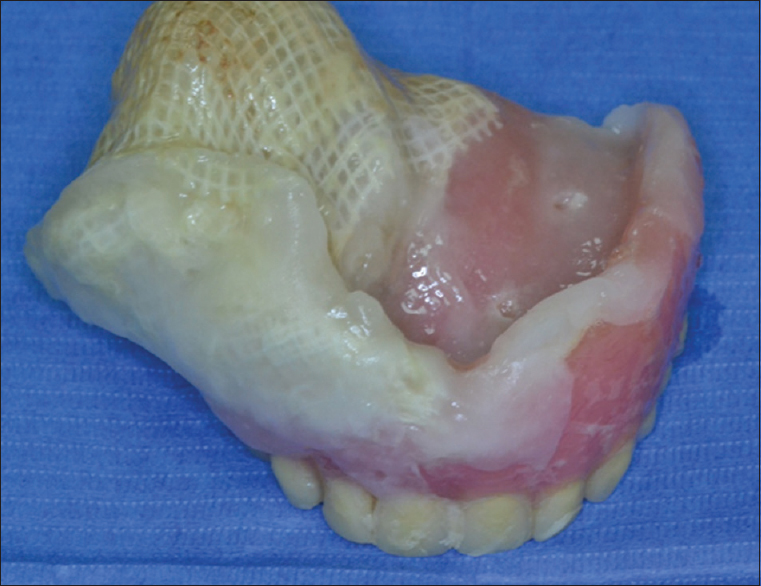 Extending the prosthesis into the defect using permanent elastomeric materials to gain extra retention from undercuts is an option but implant placement in the remaining healthy maxilla, if possible, will provide the obturator with sufficient stability and retention. Hence, speech eligibility is greatly enhanced, and the patient is able to masticate and swallow food. Alternatively, microvascular free flap reconstruction in conjunction with zygomatic implant placement and a fixed implant-supported prosthesis is a valid tool advocated by several authors, although inspection for any recurrences during follow-up is hindered. Cone beam computed tomography (CBCT) has been a valuable tool in dental diagnosis, surgical planning and implant placement since its introduction in dentistry in the late 90s. CBCT accuracy has been widely investigated and research concludes that there are clear potential benefits of using three dimensional (3D) measurements appose to direct measurements in the assessment of facial deformities. Measurements recorded by CBCT systems appear to be both sufficiently accurate and reliable enough for research and clinical use. Moreover, cone beam CT facial measurements were very accurate when compared with the physical measurements, having a mean absolute error of <1.5 mm. The introduction of 3D printing originally in the form of rapid prototyping technology has opened up new horizons in dental rehabilitation. 3D printing, also known as additive manufacturing, refers to processes used to create a three-dimensional object in which successive layers of material are formed under computer control to create an object. These objects are produced using digital model data from a 3D model or another electronic data source such as a CBCT file. Data obtained by CBCT are processed and then uploaded to a CAD/CAM system. Utilizing a Stereolithography (SLA) printer or an ultraviolet printer, light-sensitive polymers are used to fabricate models with complex anatomy in a relatively short time. A 69-year-old male patient presented in our dental practice in October 2015 following maxillectomy for removal of an SCC of the right maxilla 2 weeks prior (pT4aN2cM0 staging, dimensions 3.7 cm × 2.8 cm × 0.3 cm). The patient presented with his original dentures relined with Viscogel (Dentsply Caulk, USA) and gauzes at the time of the ablative surgery [Figure 1]. Lack of maxillary denture retention and the established oronasal communication hindered the patient in mastication, deglutition, and speech [Figure 2]. The remaining maxilla and mandible were edentulous. 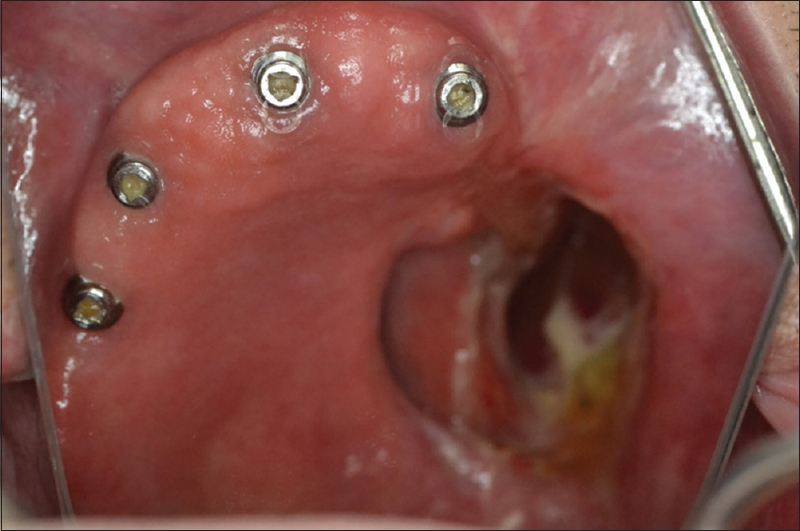 A decision to place 4 dental implants in the remaining upper jaw (Straumann, Switzerland) and 2 interforaminal implants in the lower jaw (Straumann, Switzerland) was made allowing at least 3 weeks of osseointegration before the commencement of radiotherapy. 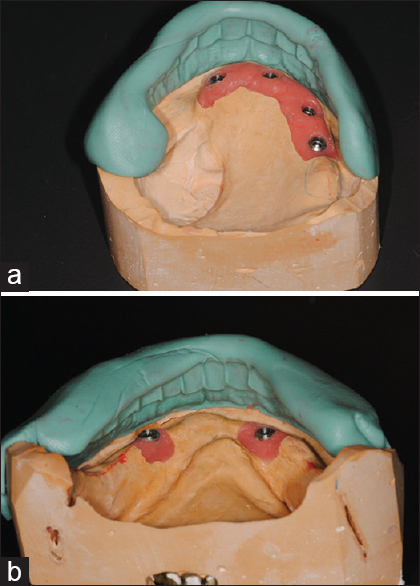 The existing upper denture was duplicated in clear acrylic and used as a surgical guide for implant placement [Figure 3]. 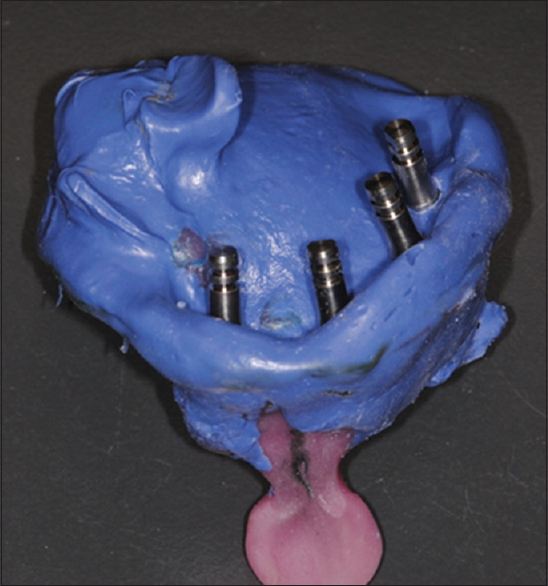 The implants in the lower jaw were positioned without the use of a splint [Figure 4]. Three weeks following implant placement, the patient underwent radiotherapy and chemotherapy. Radiotherapy consisted of intensity modulated radiotherapy treatment planning with a total dose of 69 Gy in 30 sessions and chemotherapy consisted of administration of cisplatin for 1 week. Healing of the soft and hard tissues progressed uneventfully and saliva flow, although diminished heavily during radiotherapy, was partially restored 5-month postradiotherapy. The patient did develop moderate trismus but was still able to use his relined upper denture, although with difficulty, as an interim obturator. Five months after completion of radiotherapy, the implants were uncovered and healing screws were placed [Figure 5]. A decision was made to obtain a CBCT of the maxilla and produce an acrylic resin model to serve as the primary cast instead of following the conventional procedure. 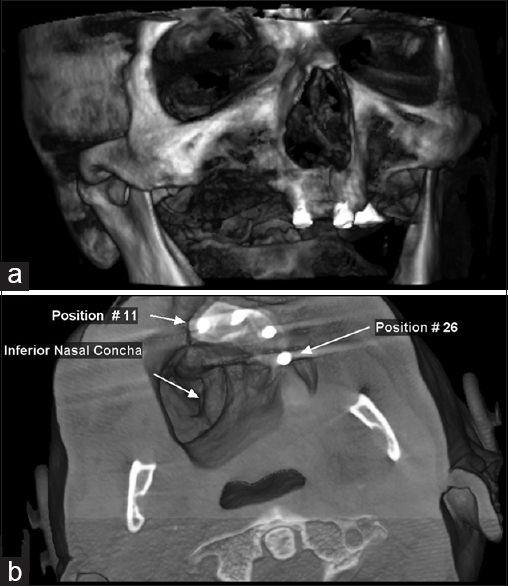 Obtaining a CBCT of the surgical site and remaining maxilla also allowed the surgeon to examine the resected area for possible recurrence before commencing the final stage of prosthetic rehabilitation. A CBCT scan was made and DICOM data were processed with dedicated 3D planning software (Romexis, Planmeca FI and Dolphin 3D Surgery, Patterson Dental USA) to produce an STL file [Figure 6]a and [Figure 6]b. 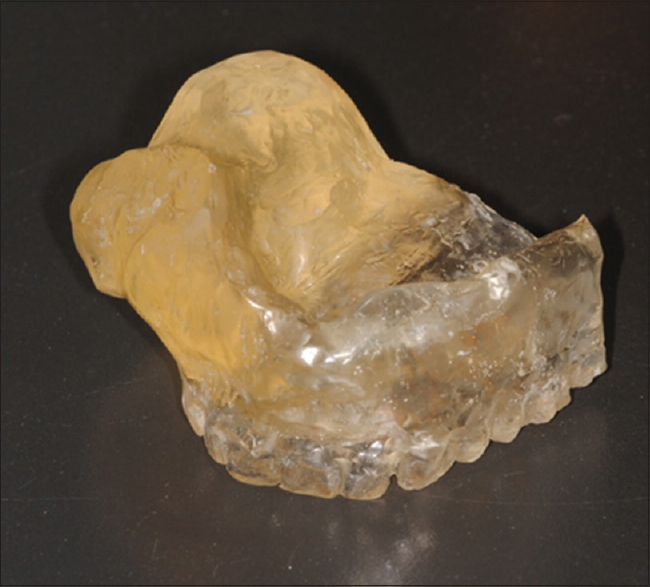 A 3D SLA printer (ProJet 6000 SLA, 3D Systems USA) was utilized for production of the maxillary resin model [Figure 7]. The acrylic resin used was VisiJet SL e-Stone (3D Systems, USA). For the mandible, a primary impression was obtained using a thermoplastic impression compound (Kerr Corporation, Orange, California, USA). A special acrylic tray was fabricated on the resin model [Figure 8] and was used to take the final impression in a conventional closed tray technique [Figure 9] using Identium (Kettenbach, Germany). A similar procedure was followed for the mandibular arch. The working casts were poured in type IV stone and the standard stages of complete denture fabrication for both arches were followed, namely, OVD and facebow registration and teeth try-in. The available interocclusal space was determined with the use of silicone indexes [Figure 10]a and [Figure 10]b and a decision to use locator attachments (Zest Anchors, USA) was made. According to the manufacturer, a minimum space of 6.5 mm in the vertical direction should be available, including the thickness of the denture base acrylic, for this particular attachment system to be used. The dentures were delivered to the patient 6-month postradiation [Figure 11]a,[Figure 11]b,[Figure 11]c. For the obturating part of the maxillary overdenture, a silicone soft liner was not deemed necessary as the retention provided by the implants was adequate and engagement of the defect was not needed. The successful obturation of the oronasal communication was evaluated with speech performance and absence of nasal leakage during swallowing. At the 9-month recall, the patient complained for loss of retention of the obturator prosthesis. All plastic male clips in the maxillary obturator prosthesis were replaced, and initial retention was reestablished. The patient remains disease-free 18 months after tumor resection [Figure 12]. Rehabilitation of oral function in maxillectomy patients using an implant retained and/or supported obturator prosthesis is a well-established treatment modality. The overall improvement in the quality of life (QOL) index in this patient cohort has been shown to be significant although still inferior to presurgical status. Wang et al. in a recent publication supported that there is no significant difference in the QOL between maxillectomy patients that had been restored with dental implants and an obturator compared to maxillectomy patients restored with a free vascularized flap and a fixed, implant-supported prosthesis. Trismus is a well-known side-effect of surgery and radiotherapy of the oral cavity. Fibrosis of the masseter and lateral pterygoid muscles can lead to a severe limitation in mouth opening, thus making prosthodontic procedures such as impression taking but also the insertion of the obturator extremely hard for both the dentist and the patient. Kinesiotherapy must be prescribed to the patient before the onset of trismus and it should continue even after the completion of radiotherapy to prevent the late onset of trismus. In a recent article, Tasopoulos et al. described a similar to ours technique for fabricating a 3D printed master model by processed data obtained by a CBCT. 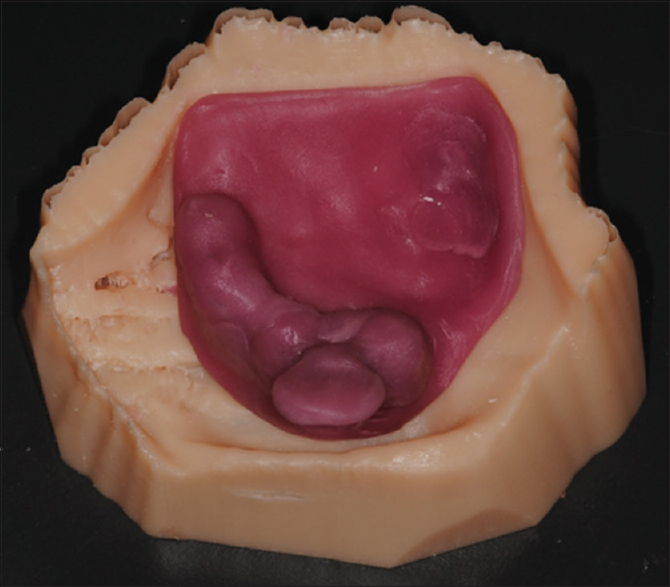 An acrylic model of the defect was 3D printed, and the obturating part of the maxillary denture was constructed from this model. A two-step clinical impression technique involving a pick-up of the obturator bulb intraorally was carried out and the final prosthesis was delivered to the patient in one piece. In the case presented here, the preliminary impression stages for the maxillary defect were eliminated and the patient underwent only one final impression procedure. This led to minimal discomfort from the frail irradiated oral mucosa and considerably less strain to the irradiated masseter muscles, exhibiting the merits of the technique. In our case, the obturator was firmly retained and supported by the dental implants placed in the remaining maxillary bone therefore eliminating the need to extend the prosthesis into the defect to gain additional retention by using a soft permanent silicone denture reliner as was the case described in the publication by Tasopoulos et al. The obturating part of the maxillary denture was constructed in hard denture acrylic resin thus making oral hygiene procedures easy for the patient to perform. One advantage of obtaining a postsurgical CBCT for fabrication of a 3D printed acrylic model is that it can serve for examination purposes. It can assist the surgeon in identifying any recurrences and in evaluating healing of the site at a fraction of radiation dose compared to conventional CT., A second advantage is that, if delayed implant placement is planned, scanning of the remaining maxilla will identify potential implant recipient sites. Furthermore, when side-effects of radiotherapy such as trismus, mucositis, and xerostomia occur, the prescribed protocol can help eliminate pain and discomfort related to initial impression taking. Our patient suffered only from moderate trismus and saliva flow reduction which made it possible to still take a final upper wash impression and an initial and final lower impression, but this pilot case report showed that using a CBCT to produce a master cast for a maxillectomy patient is a viable option when treatment side-effects prohibit conventional impression taking. Ionizing radiation from a CBCT is reported in the range of 36.9–50.3 millisievert units (usv) or 0,05 Gy which makes it insignificant compared to the dosage of 60–70 Gy usually administered to head and neck tumor patients. Nevertheless, the highest merit of the described protocol is that it allows for a complete digital workflow. Although we did not follow a full digital workflow in this patient, future trends in maxillofacial rehabilitation and further development of printable dental materials for long-term intraoral use will certainly divert restoration of the maxillectomy patient toward digitally planned and executed obturator prostheses. Although research in the field is scarce, recent results suggest that CBCT imaging leads to more accurate dental models compared to conventional impressions but 3d printing of the acquired CBCT scans can lead to higher level of deviation compared to desktop digitization or intraoral scanning. Further investigation into the accuracy of 3D printed models from CBCT scans is needed. A valid alternative to the described technique would be digital intraoral scanning of the defect and surrounding healthy hard and soft tissues. Such a technique has not yet been described in the literature. Elbashti et al. have published a technique for extraoral scanning of an existing obturator for emergency purposes using a chairside intraoral scanner (Lava COS; 3D Espe, USA). The scanned obturator was 3D printed in acrylonitrile butadiene styrene. The resultant obturator was checked for accuracy against the original prosthesis using a dedicated software and the authors reported acceptable results. A technique combining 3D printing from data acquired by a CBCT scan and conventional impression taking in a hemimaxillectomy patient was presented. The procedure led to reduced treatment time and more comfort to the patient. Further research is needed to establish the advantages and disadvantages of this technique and to shift restorative efforts toward a fully digital protocol. The author would like to thank Dr Logothetis Ioannis for implants placement, Dr. Apostolakis Dimitris for CBCT data processing and Mr Pavlakis Manolis CDT for his laboratory work. Mehanna H, Evans M, Beasley M, Chatterjee S, Dilkes M, Homer J, et al. Oropharyngeal cancer: United Kingdom National Multidisciplinary Guidelines. J Laryngol Otol 2016;130:S90-S96. Ang KK, Harris J, Wheeler R, Weber R, Rosenthal DI, Nguyen-Tân PF, et al. Human papillomavirus and survival of patients with oropharyngeal cancer. N Engl J Med 2010;363:24-35. Fourie Z, Damstra J, Gerrits PO, Ren Y. Evaluation of anthropometric accuracy and reliability using different three-dimensional scanning systems. Forensic Sci Int 2011;207:127-34. Fourie Z, Damstra J, Gerrits PO, Ren Y. Accuracy and repeatability of anthropometric facial measurements using cone beam computed tomography. 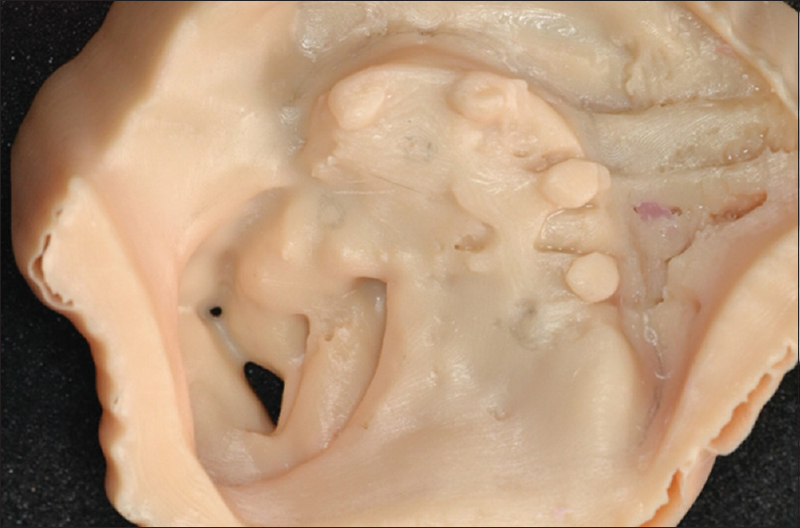 Cleft Palate Craniofac J 2011;48:623-30. Torabi K, Farjood E, Hamedani S. Rapid prototyping technologies and their applications in prosthodontics, a review of literature. J Dent (Shiraz) 2015;16:1-9. Breeze J, Rennie A, Morrison A, Dawson D, Tipper J, Rehman K, et al. Health-related quality of life after maxillectomy: Obturator rehabilitation compared with flap reconstruction. Br J Oral Maxillofac Surg 2016;54:857-62. Wang F, Huang W, Zhang C, Sun J, Qu X, Wu Y, et al. Functional outcome and quality of life after a maxillectomy: A comparison between an implant supported obturator and implant supported fixed prostheses in a free vascularized flap. Clin Oral Implants Res 2017;28:137-43. Kumar KA, Bhat V, Nair KC, Suresh R. Preliminary impression techniques for microstomia patients. J Indian Prosthodont Soc 2016;16:229-33. 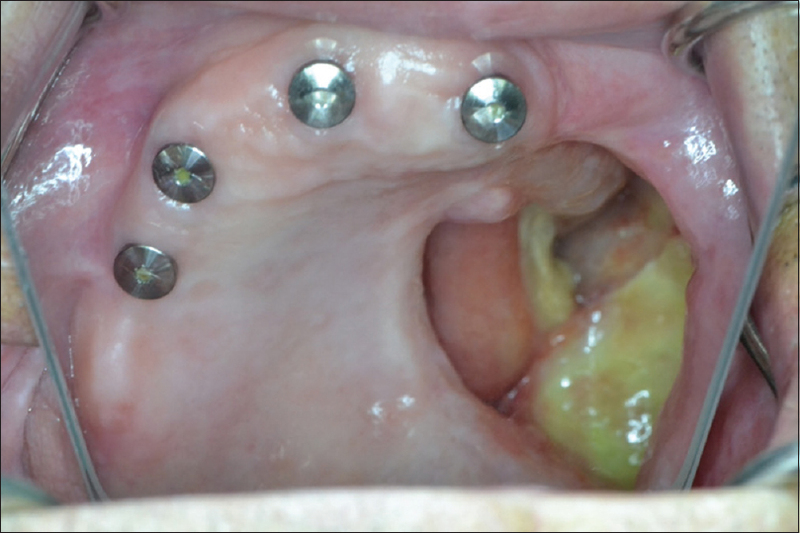 Patil PS, Rajkumar K. Rehabilitation of hemimaxillectomy with foldable obturator in restricted mouth opening: A case report. J Indian Prosthodont Soc 2013;13:612-6. Tasopoulos T, Kouveliotis G, Polyzois G, Karathanasi V. Fabrication of a 3D printing definitive obturator prosthesis: A Clinical report. Acta Stomatol Croat 2017;51:53-8. Koong B. Cone beam imaging: Is this the ultimate imaging modality? Clin Oral Implants Res 2010;21:1201-8. John GP, Joy TE, Mathew J, Kumar VR. Applications of cone beam computed tomography for a prosthodontist. J Indian Prosthodont Soc 2016;16:3-7. John GP, Joy TE, Mathew J, Kumar VR. Fundamentals of cone beam computed tomography for a prosthodontist. J Indian Prosthodont Soc 2015;15:8-13. Wesemann C, Muallah J, Mah J, Bumann A. Accuracy and efficiency of full-arch digitalization and 3D printing: A comparison between desktop model scanners, an intraoral scanner, a CBCT model scan, and stereolithographic 3D printing. Quintessence Int 2017;48:41-50. Elbashti M, Hattori M, Sumita Y, Aswehlee A, Yoshi S, Taniguchi H, et al. 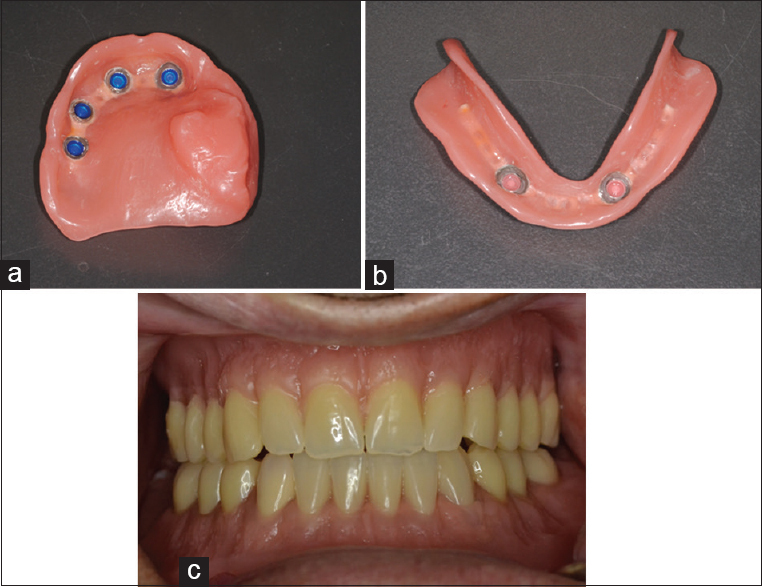 Creating a digitized database of maxillofacial prostheses (obturators): A pilot study. J Adv Prosthodont 2016;8:219-23.